Over my lifetime I have traveled to over 36 countries, many multiple times, and even lived abroad for several years. Traveling has opened my eyes and heart to new experiences, cultures, people and traditions that I would never have experienced or never could have fully understood through reading books or from listening to folklore passed down from my ancestors of many generations living in the USA. Additionally, I tend to meet educated, open-minded and curious people while exploring different countries. Many have become like family to me and will certainly remain in my life forever. So why would I want to potentially ruin a good thing by bringing my family pet on Holiday? In the past we had asked family and friends to watch our dog while we would go on holiday and take some much needed down time and thought it would be counter productive to bring a fur ball of stress with us. After all, who wants the responsibility and hassle of waking up at 7:00 every morning or being home by midnight just to walk the dog while vacationing. So many extra things to think about, like will he be okay in a strange hotel room while we go out to explore museums, galleries, eat dinner, or go out for a cocktail, all places that for the most part don't allow dogs. How much extra will this cost us for flights, hotel pet fees, travel documents and mandatory Vet visits for health certificates for the transportation and import/export of animals. But for the focus of this article let's look at how to go about choosing the best hotel. Everyone has their favorite search engine but I am a believer in conducting multiple searches on reputable sites such as TripAdvisor, Booking.com, Expedia or Kayak. And yes, I understand that many of these sites fall under the same umbrella for data however the reviews are what I read through to determine if the hotel is going to be a fit for us. On a side note, this may be obvious but make sure to use the filter feature to include Pet Friendly as well as any other amenities that you desire for the most accurate results. After I narrow down my search results to one or two potential hotels I go to the hotel website contact page and send my personal inquiry via email. Email is always best especially when there might be a language barrier which could cause confusion during a phone conversation, plus you will always have the responses in writing to refer back to if need be. The email is generally short and sweet with the goal of getting the best rate (always ask for any promotions or discounts available for your dates), a full list of additional fees, pet fees, taxes, etc. In addition I like to ask about their policy towards leaving the dog in the room while out touring or during dinner, if they include dog bowls for food and water (one less thing to pack), and if the area in the general vicinity of the hotel is safe a night for that last walk you'll need to take. 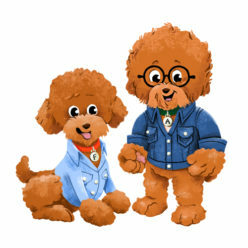 As many of you know, we have now come to travel many times a year with Agador and Fred, our two precious pups. Part of our livelihood comes from our passion for creating photos, images, art and videos taken at some of the most interesting places on earth. Including our pups in our passion has been fun for us all but it's not without a little extra effort each day. We try to schedule of of the dog friendly events during the morning and into the early afternoon. You can generally always find a place outdoors for lunch where the dogs are welcome so no need to return to the hotel until you are ready. After a long day of exploring we take them back to the hotel mid-afternoon, they are tired and will sleep through dinner while we are out for some alone time for dinner and cocktails. It's all quite simple once you get the routine in place. And if the word routine sounds counter productive to relaxation or if you're the type who doesn't want to be restricted when vacationing you might want to think twice about bringing Fido along for the ride. For us, traveling with the dogs has been a great experience. We always meet the nicest people, make new friends, and smile a bit more than we would if traveling without them. If you'd like to see a list of pet friendly hotels that we have experienced over the last few years of traveling with our dogs you can find them here under Hotel Reviews. In addition to our previous blog post The 123's of International Travel, our friends at TPG wrote a good article that address some of the related airline costs which you can find here. Whether you travel down the block, to the next city, or to the opposite side of the globe from where you reside, travel is good for the body the mind and the soul. It’s a great way to experience new cultures and make new friends. We live in New York City where we have nearby access to three major airports, metro trains, and lots of great beaches and cities within driving distance and have had the luxury to travel frequently. Although we’ve taken the pups on numerous occasions on our domestic USA travels I’ve always had this idea in my mind that Agador and Fred would be traveling with us on our next international trip. I couldn’t imagine leaving them behind. (Dog lovers you know this!) After some casual research, we determined that France is one of the most pet-friendly places on the planet and decided that this was to be our first international destination with the pups. 1. Get a 15 digit microchip. Older dogs have a 10 digit microchip and if you don’t want to have them microchipped again, buy one of those scanners. 2. Rabies shot comes after that. To be 100% certain – we needed to make sure Agador and Fred had their rabies shot at LEAST ONE MONTH before the day of travel. Note that shots given prior to microchip inserts do not count. 3. 10 days before the date of departure, it is required to have a USDA approved veterinarian to give our pups a clean bill of health. If your vet is not USDA approved, find one who is! 5. If you did all these steps and researched thoroughly your peticular situation then you should not have any problem! The next step is booking a flight! How exciting! Which airlines would want to take my pets? Since we’ve traveled domestically with US airlines, it was a no-brainer to use them anyway. Airlines such as Delta, American and United almost always welcome pets in the cabin. I can’t really say for sure that non-US airlines would take pets in the cabin but to be certain always check with your airlines first before you hand over your credit card. Ooh! and don’t forget to call them and let them know that you are flying with a pet! 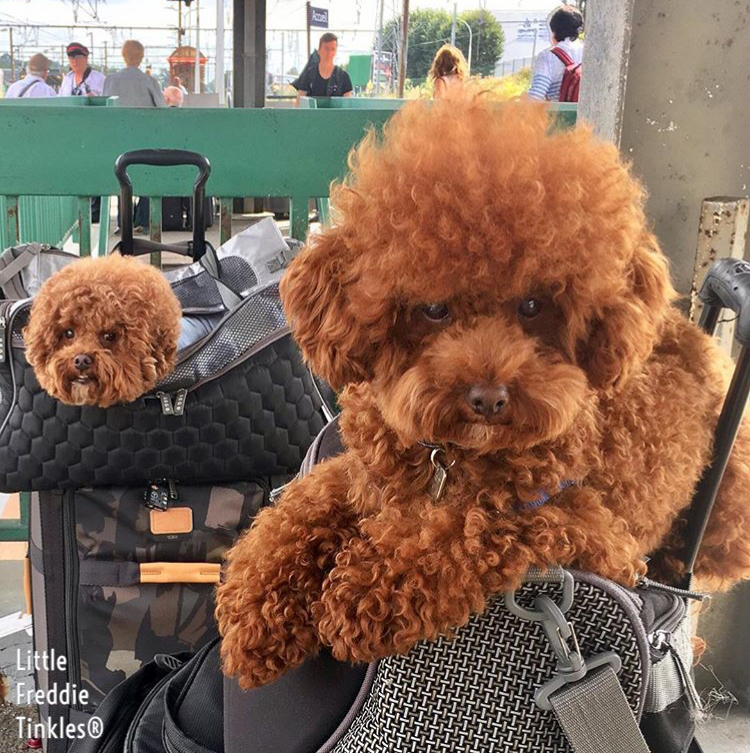 Airline pet carriers are very important for Agador and Fred. They treat their carriers as their homes and feel most comfortable in it during our travels. I love soft sided carriers because they can fit underneath the seat. Airlines have weird configurations and some hard sided carriers won’t fit at all! Who needs all that stress, right? If your pet isn’t familiar with a carrier, introduce it to them and make them feel like it’s their second home well before the travel date. Also try traveling on the metro or train, road trips and short flights. Practice is KEY! Onward and upward! Au Revoir New York City! We are so excited to have you here and hope that you enjoy our blog posts as much as our social media content. We will always try to keep our post short and sweet and to the point and of course we encourage questions and feedback on any of the information that we provide. We may be slow to respond however we will eventually try to get back to everyone. Please remember that we are not experts at anything except for taking some cute photos and videos and trying to make the world a better place one smile and one giggle at a time. Any products or services mentioned in our blog posts or depicted in our photos may be good for us and our pets but may not be the case for everyone. 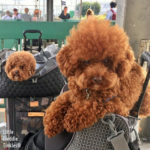 We will also be documenting our travels with plenty of helpful ideas however we highly recommend that you thoroughly do your research before considering traveling with your pet as airlines, rules, and regulations are constantly changing. That's it! We ❤️ You 😘🐾 Enjoy! Posted on September 22, 2017 September 22, 2017 Tags Disclosures6 Comments on Hello Agadorables!